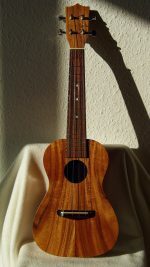 built in the same factory as koa pili koko somewhere in asia these ukuleles are sold by a small german online merchant under the brand name “ukuMele”. i got one of the very first series, still labelled as koa pili koko on the inside and headstock. the branding on the headstock was removed in the meantime. it came with martin m600 strings and shows a really nice woodgrain on the bookmatched solid acacia body. 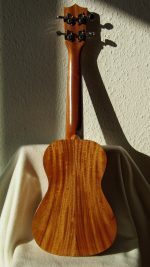 sound is warm and mellow, perhaps a tad brighter than mahogany. weighs 570g and plays nice and easy. in generation II the headstock was slightly reworked and equipped with friction tuners for a more traditional look. check out the ukumele webshop for more details. btw: this is the instrument featured in the header image.